More often than not Arkham Horror is the least rewarding, least fun game I regularly play. But I keep playing, and when pressed, would state that I like the game. I never grumble when others want to play; in fact, I get rather excited while spending a half hour setting it up. Yet there’s always a point, usually around 2 hours later, where I recognize that I would rather be playing anything else. I never learn my lesson, and go through the exact same wheel of emotions the next time it comes out. Perhaps that is Arkham’s ultimate gift to us. If we were grading board games on a curve for set-up and play time, Arkham Horror would be the curve-buster. You’ll need a good hour to punch and organize all the cardboard pieces the first time you play… and if you’re teaching yourself, get ready to spend hours with the rulebook before playing the first second of the game. Repeat plays do not get much better – you’ll always need a half hour to set up, and that rulebook will remain entrenched in your hand for your first 5 or 10 games for constant citing. And play time? The publishers state 2 to 3 hours, but you’ll need to be very experienced to hit those numbers. My first game took 10 hours, and it took me around 10 games before I could play this in 5 hours or less. Trust me… it will work MUCH better for you if you learn the game by playing with someone who already knows it well. It is so much easier to teach Arkham than it is to learn it yourself. This piece of vital information is the crux of my plea above. If you are self-teaching as I did, get ready for 50 or so hours to become passable. Of course, those 50 hours only encompass 5 or 6 games – how frustrating is that? On the other hand, I have taught this game to everyone I play games with; it takes me no longer than 15 minutes of lecture before we can play, and they get to take their turns in the comfort of knowing I’ll correct them on any rule they break. I have suffered for the betterment of my people. Given how complicated the game is, I am always surprised at how easy it is to get others to play it. I don’t know anybody who scoffs at the suggestion to play Arkham. The role-player in my circle absolutely loves it, as does anybody with a proclivity towards horror. The only thing that keeps anybody I know from jumping into a game of Arkham Horror is lacking the requisite 3+ hours to do so. I will limit all games to no more than 5 players… it easily supports more, but working cooperatively with that many people, on such a complicated game to boot, will turn this into an all-nighter. There’s monsters, guns, witchcraft… very adult game. But there’s one aspect I find highly objectionable even excepting that my children won’t play this until they’re adults – the source material. I love horror and literature, but I am no Lovecraft fan. He was a racist; unable to keep his opinions out of his work, and racism is one of life’s unpleasantries I won’t suffer. I do judge the game on its own merits, but even the brilliantly-designed game can’t cover all the racisms of the source material. Anything with Cthulhu… and seemingly every game has a Cthulhu version. But that’s just theme… there is little like Arkham Horror mechanically. It’s a unique and very deep game, well-honed since its origin in the late 1980s. I’m inclined to group it with highly strategic, epicly-lengthed games like Twilight Struggle and Twilight Imperium. It has a radically different theme than these games, but I imagine completing it feels just as rewarding. I have very mixed feelings on Arkham Horror. There is so much to admire here; so much fun to be had. There is also so much to denigrate; so much frustration. Now that I’m fully knowledgeable I’m happy to play it a few times a month – but getting to this point was a herculean task. If you’re considering getting into this game and take only one thing from my review make it this: do not attempt to teach yourself. Do not buy it to learn it and get your friends into it. Just find someone, somehow, to teach it to you. I’m glad I can have fun playing the game now, but I would take back the 50+ hours invested in getting here if I could. Arkham Horror is a table devouringly huge game based on the classic works of HP Lovecraft, where each player takes on the role of a different investigator – each with their own individual strengths, weaknesses and special abilities – taking on the quest to prevent the awakening of an ‘ancient one’. Upkeep – such as collecting money, updating stats etc. Movement – Moving to a new place on the board, or moving through the ‘other world’. Encounters – Where you either battle monsters or activate an encounter at the location you’re on – this is where most of the action takes place as you attempt to gain clues and resources. Mythos – At the end of every turn a new mythos card is drawn and has to be resolved. In general, these are there to really mess with your day as new monsters turn up, portals to other worlds appear or ongoing effects batter the adventurers. This is also the point where the ancient ones ‘doom track’ may increase, bringing them closer to awakening. Encounters and Mythos often result in the players having to pass skill checks, which take the form of dice rolls (there will be a lot of dice rolling in the game!) The number of dice rolled can be modified by both the player stats themselves (which can be adjusted in the upkeep phase to an extent) and the items the player holds. Dice can also be re-rolled by using clue tokens or other items, so whilst there is a random element to the game it’s not totally overwhelming in its randomness. If at any time a player runs out of health or goes insane they can simply discard items/money to restart – or if they are devoured their character is discarded from the game and they can restart as a new investigator. This can be frustrating late in the game, but it’s certainly better than having to sit out the last two hours of the game as your friends play on! The range of encounters and mythos is huge, and the game comes with a large number of investigators and a choice of several different ancient ones, each with its own doom track and scenario, and each representing a different level of difficulty. This means that straight out of the box the replayability of this game is huge. As with almost everything Fantasy Flight produce the components are lovely! The board is HUGE, the cards are of an excellent quality with great artwork and there are tokens provided for almost everything you could think of: Monsters – check; money – check; Counters to keep track of resources – check…the sheer volume of tokens and cards that come with this game is almost overwhelming. The game comes in a nice big box with plenty of space for everything, but it’s definitely work getting your hands on several small zip-lock bags to keep things organised to aid set up. When we play we also tend to organise the monsters and other various tokens in several small bowls, ready to be picked when required. Due to the size of the game set-up time can be significant – worth setting aside a good 15 – 20 minutes at least before starting to play. Gameplay wise, Arkham Horror is a long game, but certainly not the longest I’ve played. Depending on how many people are playing, the ancient one you’ve chosen to face and the experience of the players a game can last anywhere from three to six hour in my experience. Just the right amount of time for an in-depth game if you ask me! Arkham Horror is an awesome game, however there are definitely some things to consider before purchasing it – not least the consideration of how much table space you actually have. The game supports up to 8 players, and whilst I’m sure such a game could be epic, it could also be easily ruined if one player wasn’t really into the game – as the game is steeped in theme it’s easy to get immersed in it, but bear in mind it’s not for everyone. As a co-operative game, it’s also entirely possible to play with just one or two players, although each would need to play multiple characters to really stand a chance against the game – one of the best games I’ve played to date was just myself and a friend spending an afternoon playing 2 characters each. The game is difficult, sometimes frustratingly so, but I’m not sure I’d say it felt unfair – whilst there is a LOT of dice rolling, there are also several options to modify the result or re-roll, and being based on Lovecraft it feels right that the game seems overwhelming to the players. I love this game, but appreciate its not for everyone, but if you enjoy the theme, want an epic co-operative game and aren’t afraid of a tough challenge (and perhaps a few losses!) then I’d definitely recommend taking a trip to Arkham…just be aware you may not return with your health or sanity! Arkham Horror is to board gaming as Differential Equations is to arithmetic. Just because they’re related, and just because I’m good with the two latter items did NOT make me good at the former ones. Arkham Horror is easily one of the most complex games I’ve attempted (the Squad Leader collection of games being THE most complex). I’ve only played solo, in part because I dread the thought of trying to explain it to others. The HORROR! There are so many little rules, so many subtle things going on all at once that I have yet to get through a play-through without discovering that I forgot to implement an Ancient One’s minion ability, or add markers to the doom track, or advance the terror counter (or vice versa), etc. As is typical of a Fantasy Flight game, Arkham Horror is rife with wonderful components. I get a strange joy from punching out the cardboard pieces from an FF game. The board is a bit ‘busy’ which can make spotting the various gates and monsters difficult to see at a glance. I addressed this by using the plastic counter stands, provided primarily for investigator tokens, for gates and monsters. There aren’t enough provided for a fully tricked-out game (when on-board gate and monster allowances are maxed out) but I handle that by using similar counter stands from Eldritch Horror and Descent 2nd Ed. (also wonderful FF games). I love the artwork of this game, especially that of the individual investigators. The cardboard used for the tokens is nice and thick, with a good, strong heft to it. Even the dice are meaty, not the smallish ones FF used in Eldritch Horror (those pathetic, tiny black dice in EH are embarrassing). On the flip side, if you happen to have a lot of money burning a hole in your pocket, you can buy a copy of Mansions of Madness and use the investigator & monster miniatures from that game in Arkham Horror AND Eldritch Horror. I highly recommend this game, but only for those who acknowledge that it is complex, lengthy and above all, very unforgiving! P.S. – With all the references to Eldritch Horror in here, I realized this is almost an indirect review of that game as well. I merely mentioned it frequently due to its inseparable relation to AH. Alright, spontaneous review while my PC at work is waiting for helpdesk to fix. Apologies then if it reads rushed! Arkham Horror was the first Euro game I had ever played and to this day, I still do not regret paying for it. The artwork honestly I love with this game. The cards, board and tokens are all very good quality and capture the gritty dark tone of H.P. Lovecraft and his Lovecraftian genre. If you have ever stepped into his short stories, perhaps some of the films or even into the Chaosium RPG, you will recognise the tones fairly easy. If you haven’t, you won’t lose out much but you gain much more when you know some of the areas. Now, if you love competitive games, this is not the game for you. I’ll put that out there straight away. This is a cooperative game and if you don’t all work together as a team, then the Ancient Ones are going to chew you up and spit you out one way or another. The game itself revolves around an Ancient One coming in on their bandwagon, unleashing minions from portals of the Other Worlds until no one can stop their ultimate goals of conquest or destruction – or so they think. The above two objectives have to be done before the Ancient One gets enough tokens on it’s chart (gained through play on monsters or events) to initiate the final battle (think raid boss in an online game or even video game) where the investigators fight together and win or die trying. When it comes to who you play in the game, There is some variety to the investigators, each of them giving a special skill to use depending on the situation (be it combat or perhaps when doing purchases) and this also determines your maximum hit points and sanity. Time-wise, you are getting yourself into an approximately 2-4 hour game depending on a) how experienced you are with the game and b) how lucky/unlucky you are with the card draws. I say luck there because there has been a game where my partner and I played (with two investigators each as we do) and the game was unforgiving with portals opening as well as the events that we couldn’t keep up. On the other hand, there have been some other times where we can keep on top of the game long enough to get some headway. This game is still one of our favourites but I have to honestly say, the time to play it can daunt me depending on mood since I usually dedicate around 3 hours to play it and if needed, we just leave it set up in a room the pets (or kids) can’t get into to come back to later. Honestly though, the time it takes is VERY fun. I wouldn’t enjoy the game as much as we do if it was a one hour game. The mechanics for it just make you NEED that time to try and win. Many years ago we tried the game with a full 8 people and it was mostly new to them all that I remember that game being agonisingly slow, obviously, and took at least 6 hours to play. Over time though, if prepared more than the spontaneous game we had that day, it wouldn’t take nearly as long as that or so I hope. All in all, if you love cooperative games in a survival atmosphere but don’t want to be going against purely zombies: Arkham Horror as a base game is all you ever need. If you want to expand, there is the cheaper card expansions or the board expansions that cost a little more. We’ve bought one of each and the board expansions (ours being Dunwich Horror) are very very fun so far. A group of investigators are looking into the weird events that are occurring in Arkham. Portals are opening and monsters are running in the streets. Our job as investigators is to close all the portals, sealing them if possible, preventing an ancient one from arising. Players are provided with investigator cards which have a back story provided and player statistics. There are lots of investigators to choose from, and some are more helpful than others. The rule book states that you should select an investigator at random. I avoid that rule. What investigator people play with can have a huge impact on game success. When playing with people who are having their first Arkham experience, I would suggest helping them along with a “beneficial” character. This game is not difficult to understand, once you play it. A have hear a lot of mixed reviews about the game. I think the main reason is that on their first game play, people are overwhelmed by the rules and other people basically played their character for them. Playing Arkham Horror for the first time at a convention is one of the worse ways to get a feel for the game. Playing several rounds of a two person game, will cover most of the basics, and make the new player feel like they understand the various game phases. And there are 4 phases to this game. Upkeep – such as collecting money, updating stats etc. This is the phase where you can move the sliders on your investigator card. What this means is you can increase their speed, or will, or another stat. How much you can move your sliders is based on a characters focus. But it is usually 1-2 movement points. Arkham Horror does require some thought during this phase. It is important that you plan out your move during this phase. Do you have enough movement points to get to your target area? Are you going to have to sneak by or fight a monster? Movement – Moving to a new place on the board, or moving through the ‘other world’. Movement is also the phase when you sneak around the monsters or take them on in battle. Encounters – This is the phase where you have an encounter at the location you’re on – this is where most of the action takes place as you attempt to gain clues and resources. Encounters and Mythos often result in the players having to pass skill checks, which take the form of dice rolls. A 5 or a 6 rolled is a success, anything else is a failure. If you become blessed, a 4,5, or 6 is a success. If at any time a player runs out of health or goes insane they can go to the asylum or hospital. If they are devoured their character is discarded from the game and they can restart as a new investigator. The monsters that you are fighting/sneaking past have quite a lot of information on their tokens. They have a number that affects the amount of dice you role to sneak past them. For example if your sneak is 4 and the monster has a -2 modifier you will role 2 dice to get past the monster. You have to get a 5 or 6 (unless blessed) to sneak passed. So you failed to sneak by? Then you have to take the damage the monster hands out, and a horror check. Seeing a monster can make you go insane. Finally after your horror check you can fight the monster, and hopefully you have picked up other cards along the way that will help you take the monster off the board. There is a terror track for the game, that if you allow to many monsters on the board at a time, will start to rise and buildings you purchase items in will start to close. This is to represent the people in Arkham running in fear. This is a corporative game, and it is thrilling to watch someone get the police car, running around the board dropping off money, or weapons to investigators in need. I have heard that the review that this game goes on for hours and no one ever wins. It is true that it can be difficult to win, but with proper portal closing planning winning is possible. Even with as few as two players. Playing with three characters typically takes about 2 hours. I played a game of six people with 3 knowing how to play, and 3 new players and it took us 5 1/2 hours to achieve victory. This game comes with a lot of wonderful pieces. Set up can take a long time if you don’t have everything organized. I use two large bead boxes. For me set up and take down takes less than five minutes. As mentioned by other reviewers, a large table or two large tables are needed to play this game. In short, I love the game. You could play Arkham Horror every day and have totally different experience due to character selections and main monster selection. There are also a lot of expansions. Come to Arkham, walk the streets and enjoy the experience. Did I mention that some of the monsters fly? Maybe you shouldn’t stay in the streets too long. Arkham Horror was one of the first designer board games I played. It was a fun experience, luckily the game owner knew how to play so it was quite easy to get into the game. Fast forward five years, I started board gaming myself and one of the first buys was Arkham Horror. The game relies heavily on the universe created by the author H. P. Lovecraft. In the game, an ancient old one is about to wake up and devour/enslave the whole world. It’s up to 8 unlikely allies to stop that from happening. The scene is a quiet town in New England called Arkham, but not everything is what it seems like in this idyllic town. Be prepared to fight monsters and travel alien worlds, because that’s what you have to do in order to survive. Lots and lots of cards, medium and small in size. Cardboard tokens to represent the investigators. Big sheets for the investigators which have all the useful information, like how much health/sanity the investigator has, what starting items he/she has and what skills does he posses. The sheet also gives a nice and short background story for the investigator to set you in the mood. There’s also similar sheets for all the elder gods. The game has lots and lots of different counters. The board is a six-fold board, not too thick but not too thin either. Also the game comes with 60 monster tokens representing the different horrors that pour out of the dimensional gates. The overall quality of the components are great. I like the cardboard tokens, the art and the board itself. I do have to warn you though: the board may break up after just a few games. Happened to me and has happened to others as well. Fantasy Flight Games has a program to replace it free of cost, so it is not a big problem. This game has lots of rules and exceptions to those rules. The first few games are far from being fluid. Once you have hold of the rules, the game still takes about two hours to play. Consider yourself warned. The game has many different win objectives and many different lose objectives, which leave room for strategy. Also your character can specialize, for example give all the weapons to one player and he becomes the mean lean killing machine whose sole job is to clean the streets from monsters. Other player can specialize in closing down the dimensional gates. There’s a lot of possibilities, and since this is a co-op game, it’s strongly suggested that you communicate with the other players about your strategy. The game is fun and hard. There’s always this desperate feeling since the investigators are always the underdogs. The encounters they have at the locations in Arkham or in other worlds are almost always hostile and lethal. That said, there is a luck factor involved: every encounter is solved by the roll of dice. Your skill and the encounter’s difficulty modify that roll (the amount of dice you are allowed to roll). Sometimes the game is really easy though. This is one of the problems in Arkham Horror which prevents me from giving it a perfect 10. The game experience varies greatly by the cards you draw and the dice rolls you make and while this gives the game replay value, it also can make the game impossible or a walk in the park. The game is an excellent co-op game for people who like to immerse themselves. The theme set in the works of H. P. Lovecraft is perfect for that, since who doesn’t love the 20’s with fedoras and jazz music. The game experience varies greatly, but that gives it replay value. Some people don’t like Arkham Horror because they think there isn’t real choices to be made, but I disagree. The choices you make in the game greatly decide wheter you win or lose. It’s mostly about time management, do you chase the clue or do you fight the monsters? The game is well made, but the rules are a bit cumbersome and complex. If you can get past that, it’s a great game. Great for others who like a game with slight roleplay elements. A lot of games these days require two or more players in order to play; solo games are somewhat rare, and with good reason. Games by their very nature involve a challenge, and one of the best challenges is to go up against another player head to head. But what if you can’t find someone to play with? Well, you could play Solitaire with a deck of cards, or Freecell on the computer, but there’s very little surprises in that. Enter Arkham Horror, with the capability of involving a large number of players in a mutual goal, OR…taking on the Lovecraftian horror solo. This is no small undertaking in any case. Arkham Horror is a very involved game with a lot of setup time and events that need to be set up and prepared. But because of this, you get the sense immediately that you’re going to be in some serious trouble at some point in the game, and with a game like Arkham Horror, that only helps. Setting up the game takes roughly anywhere from 15 to 25 minutes, depending upon how well you’ve sorted out the components for play beforehand. The game box has a number of compartments to help sort things out, but if you’re smart, you’ll invest in a number of plastic bags to keep all the important parts separate. Also, there are a number of smaller cards that are available that will be used constantly during the game. Some might complain about the smaller size when it comes to shuffling, but I think this is well thought-out; the game itself requires a lot of space, and smaller cards means less space needed for the player. Once you get everything set up, however, the game rolls fairly steady. A number of things happen during the game; monsters will appear based off of the draws from the ‘Mythos’ deck, events will happen in locations during the Encounters phase, and portals will weaken the boundries between this world and the other world. Ultimately, your goal is to stop an Ancient One from awakening, but if you fail in this task, you get a chance to stop Armageddon by engaging the Ancient One in one last-ditch final battle. Well, usually…there is one Ancient One that if it awakens, you lose, PERIOD. But still, pretty gripping stuff. The purpose of this review is not to teach how the game goes, but rather to highlight what this game accomplishes that other games fail to do: make a solo run a highly entertaining experience. The Arkham Horror game can be difficult to win at times, even with a group of experienced players. Arkham Horror has a very good difficulty gauge for the number of players, however, so that the game isn’t much easier or harder with more or less players. Every game is a challenge. In fact, I would venture to say that it is somewhat easier running solo than it is with a group, simply because you have more time to take care of problems, and you know what can be done with your move. Aside from difficulty, the game makes you feel like you aren’t alone, even when you’re playing alone. The game gives you an opportunity to collect items, weapons, spells, and allies during the course of the game. The allies are a nice touch; they will add to your strength and usually provide some other beneficial effect. Allies can be difficult to get, but their usefulness cannot be underestimated. Most of the time during the game, you’ll face difficult challenges, so having a partner is a great feeling. The replay factor of Arkham Horror is excellent; the mythos deck is huge, so different events will happen all the time, and having a selection of Ancient Ones changes the game up in subtle ways. There are many different characters to play as, so it’s easy to step out of a comfort zone. Playing as Ashcan Pete will most definitely offer a different experience than playing as Joe Diamond or Bob Jenkins, for example. One should beware of feeling that the game is being unfair. I’ve played a lot of difficult games in my day, and while this game is designed to be difficult, the game is really forgivable in the fact that if your character is devoured (i.e. they die permanently), you can get another character to play as. The game is only over when the Ancient One awakens and wins the final battle, or if the characters succeed in their mission. It’s not like other games, where if your character dies, you’re out of the game for good. With this type of game, renewing characters is the best way to go. Arkham Horror is a fairly long game, and no one wants to be sitting on the sidelines all that time while the others continue on. So, in summary, this is definitely a game you want to pick up, because it is literally a game that you can play anytime. As long as you have the space, that is. Ok, my family just returned to the board game hobby after a 15-year hiatus, and consists of Me, my wife, and my two daughters (ages 15 and 13). Arkham Horror was our first foray into our recent return, and here are our thoughts. Keep in mind that I will not explain the rules of the game…if that is what you are looking for, then there are multiple outlets to procure that (this review would be 4 pages if I explained the rules, LOL). Arkham Horror is a co-operative game for 2-6 players set in the city of Arkham, Massachusetts in the 1920’s. Strange happenings are occurring in the city as the Ancient One unleashes monster gates (and other events) in an effort to return to the city to devour all who remain. The goal is to either a) seal 6 gates or b) close all gates (and have a specific # of closed gates in player possession…based on # of players), or combat the Ancient One once the doom track fills. There are definitely a TON of components, all of better-than-average quality. The player character cards have a lot of detail and variation, each with their own special abilities, starting equipment, attributes, and back-stories. Other components include Mythos cards, Gate cards, location cards, unique/common item cards, spell cards, skill cards, health/sanity/clue chits, and much more. The backs of each type of card are different in design and color, and easy to identify. The board, in a word, is HUGE. You will need a fairly large table to play AH. We utilize our entire dining room table, and it has seating for six, so this in itself might be a turn-off. Just oozing Lovecraftian theme. Location/mythos/gate card narratives really draw you into the story/events. The site description above states “2 to 3 hours” to play a game of AH. I think this is well off the mark. Naturally, your first game will take some time, as there is going to be spurts of down-time to reference rules and events. However, I cannot play a game of AH solo in 2 hours, being wholly familiar with the game. An average game encompassing 4 players will run four hours on the average…sometimes shorter, sometimes longer, depending on the Ancient One being used, as well as the luck of the draw regarding new gates. Also, setup is of note. A typical setup time for AH is approximately 20 minutes, if you have all of your chits/cars separated/baggied for ease of setup. This is markedly longer than most games. Is there some randomness behind dice throws? Yes. Is there randomness behind events that occur in Arkham? Yes. Does that ruin the game? Absolutely NOT! There is enough underlying strategy to offset a completely random game. Wounded, do we pour all players toward open gates, trying to shoot for a “closed gate” victory? Do we try to collect clue tokens, redeeming our closed gates for extra clue tokens to try to seal gates for a “sealed” victory? What will be of greater risk? Do you use precious money and tokens to upgrade your character first? Will the doom counter and open gates overwhelm the players too fast if aggressiveness is not practiced? There is a definitive strategy to the game, and it varies with each game played. Overall, the light strategy coupled with “unknown” events around every corner, coupled with the narrative of the events really turns “game night” into an “Event”. The base game alone has a lot of varied event cards, mythos cards, and location cards. Couple that with 16 different investigators, 8 different Ancient Ones, and multiple affordable expansions, and honestly, you have a winner. The base game supports multiple play-throughs (we have played probably 12 times, and have not even played “The King in Yellow” expansion, which we own), and still feel that the game is fresh. Although the manual by FFG is fairly decent, referring to the rules during your first game (even your second game) is something that WILL be required. Therefore, I HIGHLY suggest that a first-time AH player run a solo game or two to really grasp the nuances of the rules, including combat, turn structure/order, gate placement, gate closure, etc. There are a LOT of rules (I think the manual is 22 pages or so), but there is a quick-reference sheet included which is invaluable, and can answer probably 50-60% of questions. I highly recommend laminating it for future use. Allow extra time for your first family game of AH, maybe splitting it up into 2 days. Our first game took 6 hours, but only because EVERYONE wanted me to skip the solo play-through. Arkham Horror has a fantastic theme, really drawing the players in if everyone reads aloud their event cards and discussing strategies as the game progresses. The sheer breadth of possible strategy coupled with multiple characters, Ancient Ones, and tons of events beckons everyone to return to Arkham over and over. However, that being said, we never break out AH during the week, as the time investment is just too great. The length of the game can get out of control if the doom track does not progress steadily, and can start to drag. There is no player elimination component (players who die just start a new character from scratch), so all players who start the game can contribute to the end. Add in the multiple add-on expansions, and AH really stands out as a fantastic lasting investment for someone who wants a thematic romp in a horror setting. Opinions from the kids: The game play-time is the only real drawback to this game, which we feel is fantastic. More theme than Runebound (which we really enjoy), and lots of different characters that we can be. We have even created characters with our faces, names, etc. from online utilities which my dad located 🙂 . To us, the game is more fun if we can split it between two weekend sessions of 2-2 1/2 hours each). For necessary shorter game-time sessions, we usually play Dominion or Cosmic Encounter instead. Opinions from the wife: Love the game, but almost too rule-intensive. Seems every game a nuance comes up that we have not encountered that requires internet research, although after about 5-6 play-throughs, the need to really research some odd rule nuance is waning significantly. Not real crazy about the time investment, although the investment time is shortening with every session…I doubt a 4-player game will ever be shorter than 3 hours. Each player has to conduct their turn by performing the refresh phase, determining where to move, carrying out an event (or multiple events if combat is included), as well as mythos card actions…you get the picture. Fun game though…just not my favorite (that is Cosmic Encounter). After Settlers of Catan, Arkham Horror was the first game I purchased when I was first getting into board games. In many ways it was an extreme step up in difficulty and depth but to this day it remains one of my favorite games in my collection. Arkham Horror is a co-op board game based set within the mythos of H.P. Lovecraft’s collection of “weird horror/fantasy” tales. Fans of Lovecraft’s work will have plenty love with this game as every facet of the game is flushed out with tons of flavor and lore ripped almost directly from the pages of his stories. Gameplay consists of moving around the board, which represents the fictional town of Arkham, Mass. ; dealing with otherworldly encounters both within the town and on other planes of existence; and racing to close gates linking this world to these other worlds before the elder god awakens and wreaks havoc on the players. Along the way, players need to collect spells and weapons to defeat creatures that escape from these rifts. Successes for defeating these monsters, as well as accomplishing various other tasks, are determined by rolling a set of six-sided dice. This is the basic concept of the game but the official rules are much more deep and nuanced than they appear. My only complaints with the game are the incredibly steep learning curve and the game’s overall difficulty. If all players aren’t completely focused on what they need to accomplished, the game can very quickly become overwhelming. Even if things appear to be going in the favor of the players, it only takes one turn for the game to snap back and screw everyone over. Overall, Arkham Horror will always be a favorite among my play group. With a play time that typically lasts three or more hours, it’s rarely a spontaneous play and usually requires us to set aside a few hours ahead of time. I highly recommend it if you’re looking for a challenge with a great atmosphere. Arkham Horror is a cooperative game set in the H.P. Lovecraft universe. Players take on the roles of “Investigators” whose job it is to find clues, fight monsters, and ultimately seal the dimensional gates. If the investigators fail to seal the gates in time the “Ancient One” is revealed and must be slain or else all is lost. The best part of Arkham Horror is the immersive theme. It uses Lovecraft’s characters and setting perfectly to capture a sense of dread and fear. The artwork on all the cards and monster tokens is very high quality. The board is slightly ugly to look at, but it goes well with atmosphere of the game. The biggest barrier to playing this game is getting the energy to set up the board. If you’re new to the game it may take a half hour or more just to set up all the pieces. There’s literally hundreds of tokens and cards to sort out. The board itself is quite large, and there’s no place to even put the cards to draw them easily. You need a large table to play this game. The gameplay is similar to other role playing games, and can be daunting to new players. Players take turns completing four separate “phases”: upkeep, movement, encounters, and mythos. Most the action occurs during the “movement” and “encounters” phases as this is where you will do most your monster battling and card drawing. The “mythos” phase is usually when things go from bad to worse. At the end of each round, players draw a mythos card during the final phase and resolve the actions listed on the card. Most of the time this will add more monsters or else some obstacle that must be overcome. The game is relentless, there’s no card that tells you that you’ve won 10 dollars in a beauty contest. The encounters are almost always negative, and even if they are positive you usually have to pass a skill check to reap the reward (and if you fail you may suffer a punishment.) The post game scenarios with the Ancient Ones are typically even more brutal, and most of the time I choose not to even try to beat them (especially considering everyone is usually already beat to a pulp when the Ancient One is first awakened. )The game takes anywhere from 1 1/2 – 5 hours to play and victory is very rewarding. The game is better with more people, especially those who know what they are doing. Arkham Horror has a great atmosphere, wonderful components, and rewarding gameplay. It can be confusing to learn and hard to set up, but the effort will probably be worth it for most lovers of cooperative games. The “Ancient One” post game boss is a little gimmicky, but helps set the mood by providing a real threat to failing to seal the gates. If you have the patience to learn it and you enjoy cooperative games, it’s definitely worth picking up. IF you are a fan of H.P. Lovecraft and/or coop board games you will most likely enjoy this. Tons of different investigators for players to choose from with each their own flavor. Visit other worlds, slay monsters, and collect items to win the game. After the setup the players choose which investigator they will play and then choose a starting player. Each player will have little stats on their character sheet that differ from one to another. There will be 3 trackers as well which each have 2 associated numbers. Players can increase and decrease certain stats to help them out in different situations, however this step has to be done at the beginning of the round. To begin the game the players draw a mythos card that will start the monsters and other world portals to spawn in the town and possibly other nasty stuff. Starting with the first player each player will move around the town and have encounters at their locations or use the locations special action. IF they move into or land on a monster they have to try to roll and sneak past or fight it. Once everyone has completed their turn they reveal another mythos card and the cycle continues. If at any point too many creatures are on the board the doom tracker moves up one and one ally will leave town, or possibly one shop will close. if it ever reaches 10 the boss monster awakens and you are forced to fight him. During the game the players will have to enter portals and explore other worlds in order to close portals so they dont become overwhelmed with monsters, but sealing portals is the important part. If a portal is sealed there can no longer be any more portals or monsters spawned from that location and when a certain number of portals are sealed the players will win the game. If the boss monster awakens the players will have to fight him in which it varies what each player has to do but will always get progressively harder with every turn the players make. This game is tons of fun for everyone with a great theme. Try the new lighter version of the game called Elder sign if you enjoy this one. This is the game that got me back into the hobby after a long break. It is extremely cumbersome and fiddly, takes hours to play and usually ends with all players losing. The game board is huge with tons of different card stacks and tokens to manage. Add in a few expansions and Arkham Horror will devour even the largest table. Events are drawn randomly and resolved with dice. Even your most cunningly executed plan can go out the window with the roll of a die or an unlucky draw. After saying all that the most important thing I can say about Arkham Horror is I LOVE THIS GAME! Where Arkham Horror really shines is the tension created by the escalating threat of the slowly awakening Old One. This game requires cooperation and planning in order to be successful. Some of the best moments are when you collectively pauses to look at the big picture and realize your chances of winning are nearly hopeless. Often I find our losing games to be more enjoyable than the wins. Nothing is better than pulling off a victory when defeat was almost certain. This game is at its best when everyone is scrambling around frantically trying just to stay alive. The rules can be difficult to learn for a first timer. It helps a lot to have at least one experienced player around to help run the table and answer questions on the rules. Be careful not to let a single player take command of the entire group. Nothing saps the fun from this game as much as one person dominating the decision making. Experienced players should give advice but try to avoid making decisions for newer players. 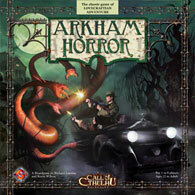 The theme is really strong and Arkham Horror can be played as sort of a light RPG if your group enjoys role playing. Regarding expansions: Read the reviews and get the ones that you find most appealing. I’d recommend King in Yellow. You don’t need them all just introduce a new one now and then if things are getting stale. Arkham Horror is a cooperative board game from Fantasy Flight Games. It’s for one to eight players, and is around the writings of early 20th century weird fiction author H.P. Lovecraft. The players control investigators from the 1920s who are trying to stop the ancient, cosmic evil beings that threaten the fictional town of Arkham, Massachusetts. If the bad guys make too much headway in the town, the Ancient One awakens — and this is usually a bad thing. Players spend their turns moving around the town, fighting monsters, gaining valuable clues, gathering better equipment, investigating various locations (both in Arkham and in “other worlds”), and so on. The game can be pretty unforgiving in its difficulty, which could be good or bad depending on the players involved. I love the game’s atmosphere. While the game draws mostly from Lovecraft’s Cthulhu Mythos stories (as well as some of the tales written by Lovecraft’s peers and followers), it also includes elements from his Dream Cycle and macabre tales. Elements from the three story categories mesh well together in the game, and result in an atmosphere that keeps the themes of Lovecraft’s stories while injecting some insane pulpiness. So even though there are gibbering, amorphous creatures and Cyclopean forms of architecture all over the place, there are also two-fisted gumshoes and gunfights in the streets. There’s also a good deal of replay-ability with the game. There’re over a dozen investigators to choose from, eight different Ancient Ones, hundreds of Mythos and location cards, scads of items, spells, skills, and so on. And this doesn’t even factor in the many expansions. I’ve played the game quite a bit, and no two games ever went the same way. While the game can work well with small or large groups, I really appreciate being able to play it solo; there have been a few rainy Saturday afternoons where I set up the game myself and had a blast fighting off cultists and exploring ancient tombs and dream worlds. The game’s set-up, no matter how many times I’ve done it, always feels like a chore. There are so many different bits and pieces to keep track of, and it sometimes ends up being overwhelming. The game itself can also run on way, way too long. It the players are having fun, this isn’t a problem. If they’re NOT having fun, the next point can happen. I also don’t like how the game can sometimes disintegrate into a twitching mass of game mechanics. All of the cards are filled with great flavor text, but it can sometimes feel like its stretched thin over the dice rolling and stats. I always try to offset this by making sure to immerse myself in the text (including the bios on the back of the character cards). The game can be a great roleplaying (lite) experience, I’ve played more than a few games where players just roll dice and add up all of the fiddly numbers. Arkham Horror is one of my favorite games. There’s so much going on and so much flavor that I always look forward to the next run through. It’s certainly not for everyone, but there’s a lot here for those that do enjoy it. As a huge fan of H. P. Lovecraft and of Cthulhu Mythos games in general, Arkham is one of my favorites. The base game is a lot of fun and has considerable replay value, courtesy of the different combinations of Ancient Ones, Investigators, and the way Location Encounters work. Add in some or all of the many great expansions and the odds of seeing the same game twice are virtually non-existent. Familiarity with Lovecraft’s stories can add to the fun as you encounter characters and places from the stories, but is hardly essential. Arkham can take a while to learn in its entirety, not because the rules are complex but simply because there is so much that you can do in the game. The expansions are well worth adding, but you may want to add them one at a time to give yourself time to familiarize yourself with the new elements each one introduces. The only drawback of the expansions is with all the boards and card decks, the game can take a while to set up and requires an unusually large play area for a board game. That being said, the game is well worth it. Other than the story rich environment of the game and the diverse ways in which each game can play out, I also really like the way the game scales itself based on the size of the play group. With anywhere from 1-8 investigators involved, the game manages to be challenging to any sized group. In a few cases, some Ancient Ones actually are more or less formidable against larger or smaller groups. You really never do know how the game will play out or what to expect, and every time you play it’s a new story. I bought this game some time ago on a whim. “I like Cthulhu,” I said to myself, “so this game is probably for me.” The first thing I noticed was the sheer amount of content in the box: a massive board, character sheets, character tokens, a plethora of cards and tokens, and dozens of monsters. It was a bit difficult to learn initially, but once we were in the swing of things, the game really got rolling (I still have to consult the rule book from time to time, though). The game can be rather overwhelming at first, with all sorts of monsters everywhere, portals opening, and an elder horror looming overhead. I urge everyone who wants to try this game to work cooperatively, as you really have the most fun that way. There is a lot of replayability in this game. You’ve got a good number of elder horrors that could be awakening, and gameplay is different for each one of them. Some are more brutal than others, such as Yog-Sothoth, who ends the game if he is awakened. Others are easier to play against, but each offers its own unique challenges. I urge everyone who plays this to not be discouraged if you wind up losing–that’s half the fun. I’ve recommended and played this game with dozens of friends who all wound up having fun. This is a solid investment for any avid game lover. Add a Review for "Arkham Horror"